On 25 April 2018 WOW Air launched a new flight from London Stansted Airport to Reykjavik Iceland (KEF) with a brand new Airbus A321 TF-DOG. The aircraft was only delivered the day before flights began. 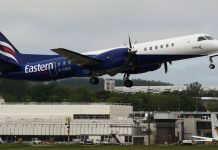 The flights operate from Stansted to Reykjavik with onward transatlantic connections. This video features the first arrival and departure from Stansted Airport for the new service with the new airbus A321.